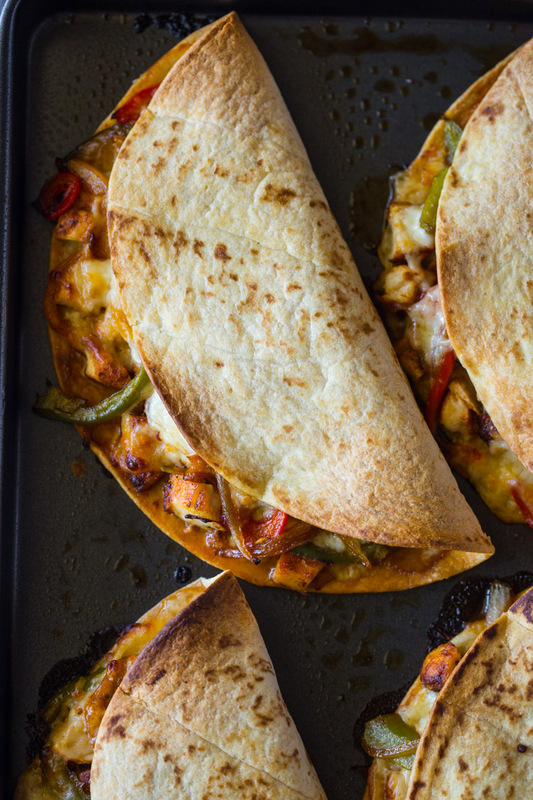 Crispy chicken fajita quesadillas are oven baked making it healthier and easier to make quesadillas for the whole family on a sheet pan! You guys.. It’s official. Oven baking quesadillas is the BEST and only way they should be made. Baking them gives the quesadillas a unbelievably crunchy shell and allows all the flavors to fuse together for extra flavor and texture. 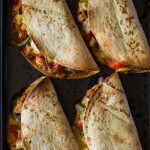 These quesadillas are loaded with fajita spiced chicken, bell peppers, onions and plenty of cheese. I used boneless skin-less chicken breasts but boneless skin-less thighs work great too. For the cheese I used a blend of mozzarella and Monterey jack but ANY melting cheese works great in quesadillas. Start off by seasoning your chicken breasts with fajita spices. You can use a prepared packet of fajita seasoning of use my fajita seasoning recipe below (in notes of recipe) if you have all the spices on hand. Pan sear the chicken in a little olive oil until the chicken is cooked through and has developed a nice crust. Next slice bell peppers and onions. I used a trio of bell peppers for presentation but any color will do. Remove the chicken from the pan and add the veggies. While the veggies are cooking, dice the chicken then stuff the quesadillas with the chicken, veggies and cheese. Bake for 20 minutes, flipping once, or until golden and delicious. Enjoy with sour-cream or your favorite salsa!! Pre-heat oven to 400F. Grease a large baking sheet with cooking spray or olive oil and set aside. Place chicken and fajita spices in ziplock bag or large bowl and combine until chicken is fully coated. Heat 1 tablespoon oil in a large heavy-duty pan for at least 2 minutes. Add the chicken and cook on medium-high heat for 5-6 minutes on each side or until cooked through. Cool for 4-5 minutes then chop into small pieces. Remove chicken from the pan and add the sliced onion and bell peppers to the same pan. Cook on high heat for 2-3 minutes or until lightly charred. 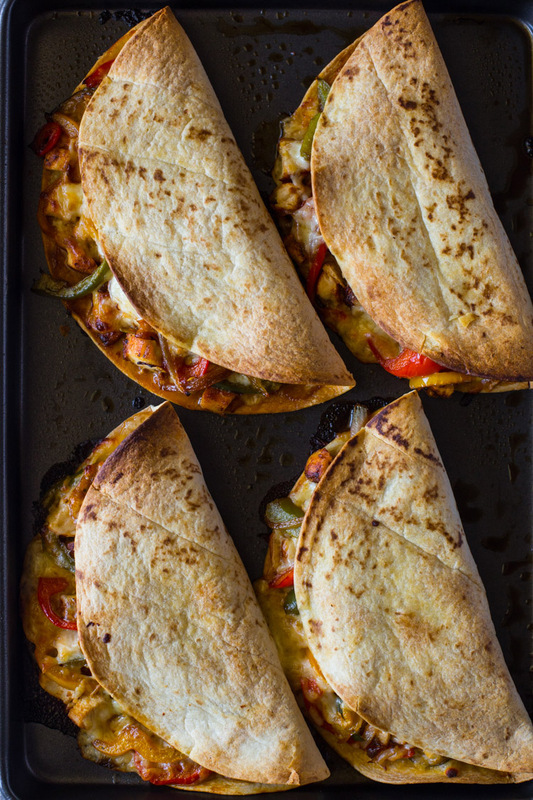 Place the tortillas on the sheet pan and fill each half with 1/4th of the chicken mixture, 1/4th of the bell pepper mixture and 1/4 cup of cheese. Fold and spray with cooking spray. Bake for 10 minutes, flip and bake for 10 more minutes. Remove from oven and serve immediately while hot. We like to dip them in salsa, sour-cream or guacamole. Enjoy! To make about 2 tablespoons fajita seasoning: Combine 1 teaspoon cornstarch, 1 teaspoon chili powder, 1/2 teaspoon salt, 1/2 teaspoon paprika, 1/2 teaspoon cumin, 1/2 teaspoon sugar, 1⁄2 teaspoon onion powder, 1⁄4 teaspoon garlic powder, 1⁄4 teaspoon cayenne pepper. These were delicious and so easy to make. I love how they got crunchy in the oven. Will definitely make again. Also loved your seasoning recipe! Excellent and so easy! My family enjoyed and we will def make again.